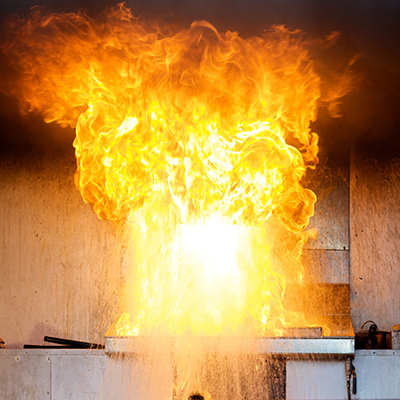 One of the most common causes of house fires are grease fires in the kitchen. These fires need to be handled quickly and without hesitation to prevent the spreading of flames. Below are a few common ingredients to put out grease fires in kitchens and those that should never be used. Grease fires are caused by overheated oil. To prevent overheating and ignition, remove any smoking oil from the heat source immediately. Besides intentionally heated oil, oily or greasy burners, microwaves, as well as standard and convection ovens can cause grease fires as well. In case of a grease fire, remove the heat source by shutting off gas or power and attempt to remove oxygen by covering the pot with a non-flammable lit or pan. If these attempts are unsuccessful you can use the following kitchen ingredients to put out the flames. Baking Soda – it releases carbon dioxide, which takes away the oxygen the flames need. Water – will splash back and will spread drops of hot oil, making the fire worst and will injure people standing around. Wet towel – due to the water contained in the towel, it will cause the fire to flare up and is able to spread the hot oil around the room. The safest way to put out a grease fire is the use of an appropriate fire extinguisher. If you or someone in your home cooks often with oils, it is suggested that you invest in this type of extinguisher. For grease fires, you need a class B – “dry chemical fire extinguisher” or a class B-C “kitchen fire extinguisher”. For example on Amazon you’ll find First Alert AF400 Tundra Fire Extinguishing Aerosol Spray for $13 or First Alerts Rechargeable Extinguisher for just $25. A small investment for the security it offers. Remember, don’t use a water-based extinguisher due to the effect water has on grease, which were mentioned above.